For more information, click on an event. May 2nd – 5th 2019 – American Daffodil National Show and Convention hosted by Minnesota Daffodil Society, in the Minneapolis, MN area. Come join us for some Daffodil fun! February TBD – we hope to see you next year! 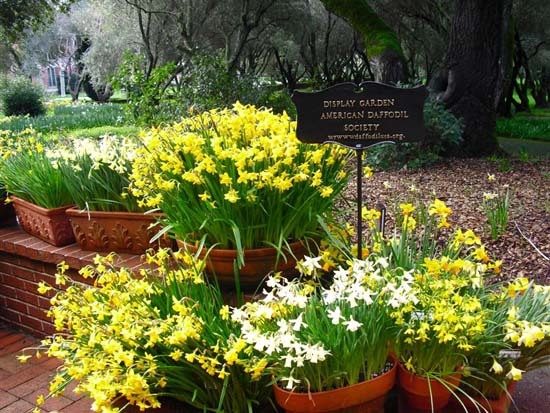 Filoli, part of the National Trust for Historic Preservation and a designated American Daffodil Society Display Garden, will host their grand spring opening. Filoli is conveniently located about 25 miles south of San Francisco and 30 miles north of San Jose. The country estate is at the southern end of Crystal Springs Reservoir and on the eastern foothills of the Santa Cruz Mountains. NCDS members will join this celebration and bring daffodils and host an information table. Below is the 2019 NCDS Show Schedule and includes classes and rules for Horticulture. Below is the 2019 Fortuna Show Schedule. This Show Schedule includes the classes and rules for two sections, Horticulture and Artistic Design. 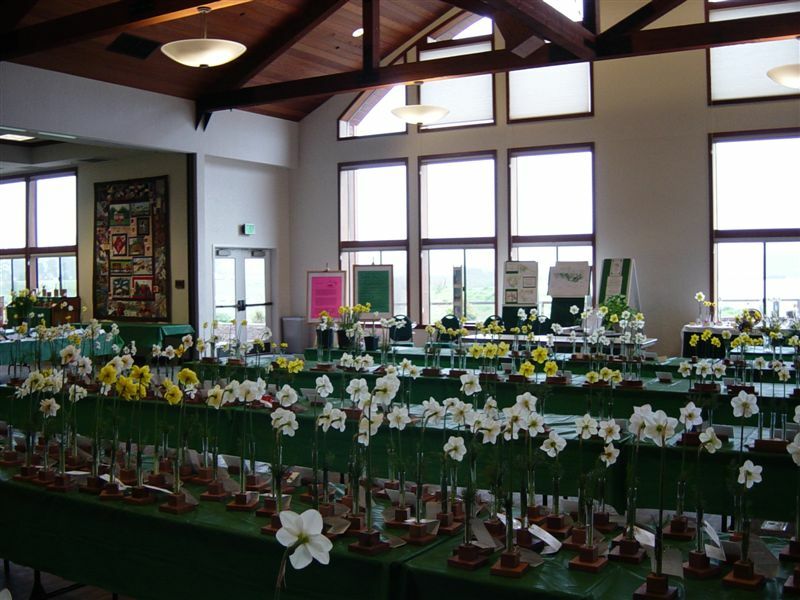 Please come to 49th Annual NCDS Daffodil Show Alden Lane Nursery, 981 Alden Lane in Livermore. This nursery is a wonderful host and a delight to stroll through and view beautiful plants and flowers. Show entries will be accepted Friday evening and Saturday morning. While you are in Livermore, notice the substantial daffodil plantings around the city sponsored and planted by the Amador Valley Garden Club. Dinner while staging blooms – food will be available for all stagers. Chairman, Bay Area Daffodil Show Map to Alden Lane Nursery. March 2nd, 5:30 p.m.Here’s our time to meet with friends we haven’t seen since last Spring or Fall. Our annual NCDS Membership Meeting and Dinner will be at the Terra Mia Restaurant in Livermore.While dinner is being prepared, there will be the Annual Membership Meeting of the NCDS. Please advise Kirby Fong if you plan to attend so he can ensure enough space for our large group. This is the Pacific Regional Show. 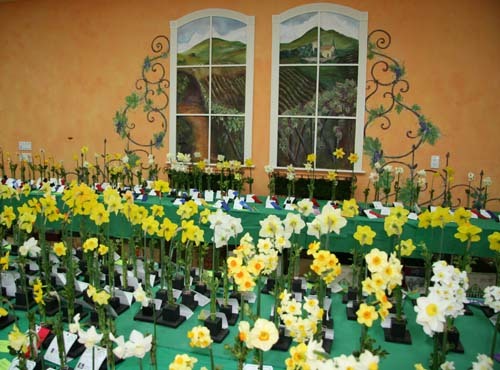 The 24th Annual Mother Lode Daffodil Show is sponsored by the NCDS and hosted by Ironstone Vineyards in Murphys. On the country road to the winery, you will marvel at the thousands of naturalized daffodils blooming along the roadside and across the landscape. 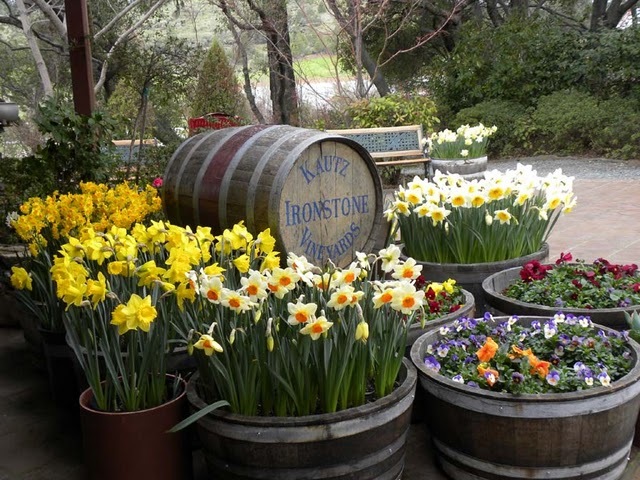 At the winery itself, you’ll be greeted by spectacular barrels of brightly blooming daffodils. But these are just appetizers! In the Showroom you’ll find captivating daffodil exhibits in horticulture and artistic designs. The horticulture show will be held in the Heritage Room, one floor below the Museum & Jewelry Shoppe. Entries will be accepted Friday afternoon and evening and early Saturday morning. The show opens at 12 p.m. Saturday and 10 am Sunday.You will be awed by the millions of naturalized daffodils growing in the countryside around Ironstone. This is one of the reasons it is a designated American Daffodil Society Display Garden. 3:00p.m. Dismantle show and sell daffodil bouquets! March 9th 6:30 p.m. will be at Alchemy Market and Wine Bar/Cafe, Murphys. On Saturday evening, there will be a dinner open to daffodil enthusiasts at a lovely restaurant in Murphys. Enjoy a wonderful meal while reconnecting with our friends in the California’s Gold Country. Contact Bob Spotts if you would like to join us for this wonderful dinner. River Lodge Conference Center by the Eel River in Fortuna March 23rd-24th. 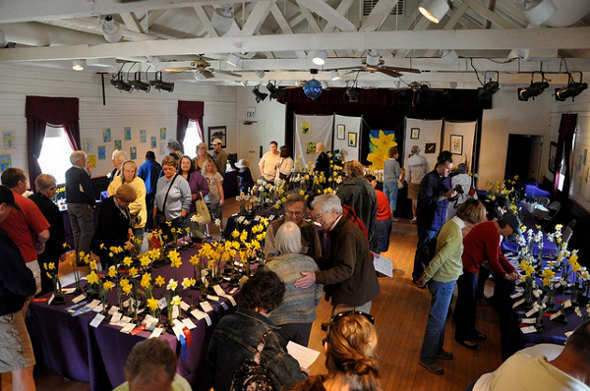 The Fortuna Garden Club invites you to attend their 44th Annual “Daffodils by the River” Daffodil Show. The show hours are Saturday, 1 to 5pm and Sunday, 10am to 4pm. Admission is free. Those interested in entering daffodils and/or floral designs please contact Maria Krenek. Lodge Conference Center, 1800 Riverwalk Drive in Fortuna. Several excellent motels are just across the street and two restaurants are within walking distance. Enjoy wonderful music, coffee, tea, punch, and cookies provided by members of the Fortuna Garden Club. View the beautiful daffodil arrangements as well as the wide range of exhibition daffodil varieties. Purchase a pot of blooming daffodils to take home. Here is a link to an article about this beautiful show.If you cannot attend, you can watch this event live on the Internet via the FortunaCam! 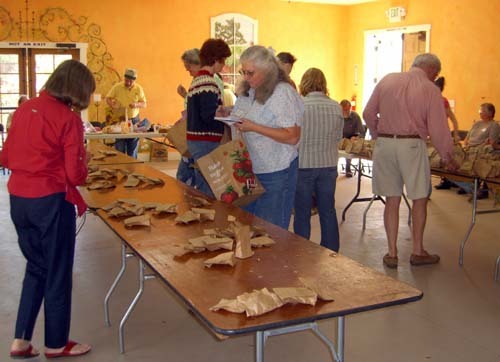 Dinner – Fortuna Garden Club members frequently provide something tasty! Fortuna, CA 95540, tel: (707) 725-6822. CA 95540, tel. (707) 725-7025. March 23rd 7:00 p.m.Saturday evening, there will be a dinner open to daffodil enthusiasts at the historic Ivanhoe Hotel in the beautiful scenic town Ferndale. 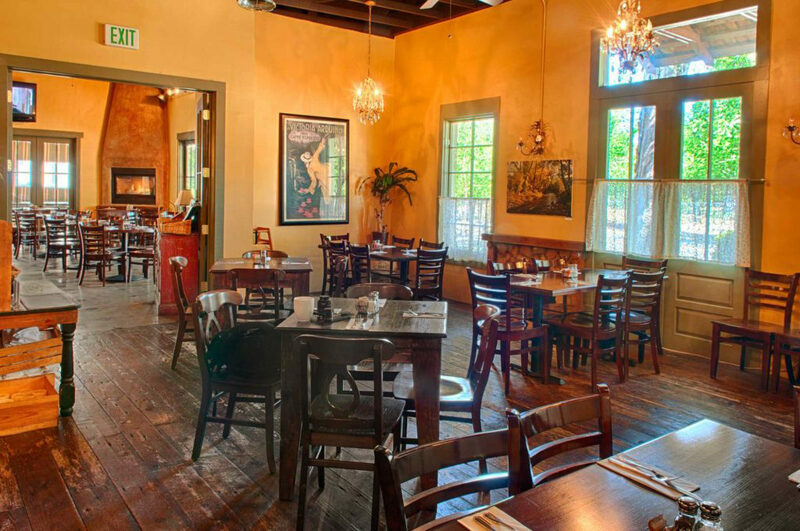 E-mail your reservation and menu selection to Maria Krenek Map to Ivanhoe’s in Ferndale. Go to Ferndale early and see the beautiful Victorian homes and visit the Black Smith Shop. These sites are not to be missed! March 23rd Julian Daffodil Show Come celebrate Spring with the Flower of Hope at Julian, which is just an hour east of San Diego, in the beautiful Cuyamaca mountains. Admission is Free! Click on this link, “Julian Daffodil Show 2010” to see beautiful photos from that year’s show. Friday, March 22nd Noon – 5 p.m. – Bring all daffodils for display & judging. 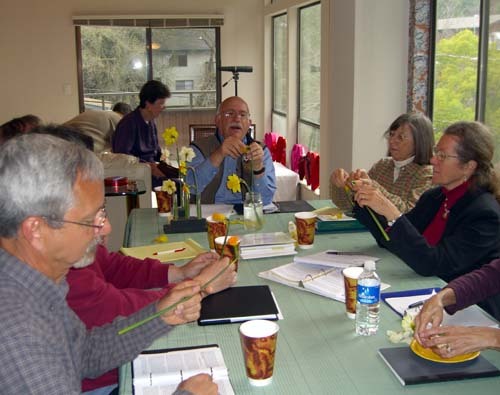 Names and questions about daffodils will be answered by Daffodil Society experts. Look at those bags of bulbs that need a good home! Sunday, November 4th, 2018, our last daffodil event of the year is for NCDS members only and is our Fall Potluck Party and Daffodil Bulb Sale, beginning at 12:00 PM until 4pm at the Alden Lane Nursery in Livermore. Keep in mind, by joining NCDS ($15 per household) you are eligible to enjoy all afternoon events including the bulb sale – easily a value far in excess of the cost of a membership! There are bulbs donated from hybridizers and bulb growers from all over the world. Experts will be available to assist new members with your bulb selections and growing advice. The party format will be the following: a bulb sale with each ticket purchased guaranteed a daffodil bulb; bulb auction of select daffodil bulbs, followed by a potluck meal; refreshments, dinner plates, and cutlery furnished by NCDS. Jan plans to bring her famous smoked turkey! We thank Jacquie Williams-Courtright of Alden Lane Nursery for inviting us back again this year. Be sure and put our bulb sale on your calendar as a ‘must attend’ for an afternoon full of daffodil bulbs, fun and great food! Map to Alden Lane Nursery. Please note, NCDS Board of Directors meeting will be held at 11:00.